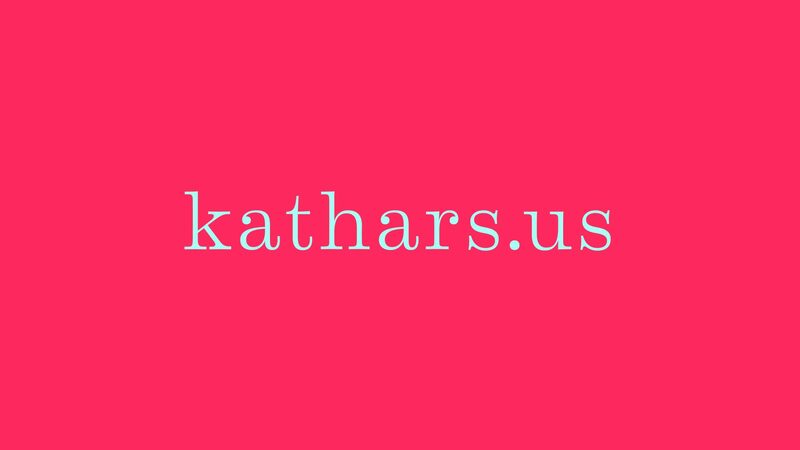 Please keep in mind kathars.us is not yet mobile friendly. When reading Living a Feminist Life, I was struck by the relief the prose provided me, more specifically, the feelings of validation I felt as Sara Ahmed articulated her experiences and struggles. Reading Ahmed reminded me of moments from my past, engaging with the works of Zadie Smith, Angela Davis, or Audre Lorde, and the feeling of coming into contact with characters, narratives, experiences, and histories that mirrored much of my own reality. I think what can often exacerbate oppression or hardship are the feelings of apprehension and isolation that come along with them. I wanted to create something that could help someone like myself, acting as an affective mirror and corroborating the experiences that so often go hand in hand with minoritized existence. I was inspired by Ahmed’s discussion of feminist literature, and how informal book collections are created and maintained by women of like minds. Further, she limits her source material for the book to the work of non white/cis male individuals. Doing so can result in, not just an expansion of knowledge and an uplifting of underrepresented voices, but, provides a minoritized reader with recognition. Such literature often acknowledges the discomfort in difference and the added misfortune that can befall minoritized individuals and communities. As a queer woman of Middle-Eastern and English descent, Ahmed often articulates her own lived experience in academia and pieces of her personal life and familial relationships. Her discussions of the intimate parts of her life, in concert with the struggles of her professional existence, erase the boundaries that so often shape the lives of minoritized peoples. Her book, and this way of considering the whole of a person, draws attention to the experience of being in a place of privilege or professionalism when those things that weigh on you become unspeakable, however, are nonetheless internally vociferous and overwhelming, as they interrupt your activities regardless of their given “appropriateness.” Or when your peers, while possibly helpful or kind, are only your peers in certain respects, as you struggle to connect and identify with—and ultimately trust—those around you. In her efforts, she, like so many feminists of color before her, muddles the boundaries that separate facets of experience and acknowledges the whole of herself and her reader. As I, in my own recent battles with doubt and grief, found comfort in Ahmed’s words, I wanted to take up her strategies of “citation” (15) and feminist writings and scholarship in order to create an emotional archive of sorts. I chose these strategies both, because I believe such work to offer a point of identification and validation, and, as discussed by Ahmed, I feel clear citation allows minoritized individuals to find, hold on to, and share work important to our struggle, preventing the erasure of minoritized authors. In addition, as such scholarship can often be hard to penetrate, not necessarily because of dense or convoluted language, but because it can be difficult to know where or how to begin. I thought a well cited compilation would allow a user to better engage with writers they may feel kinship towards and possibly encourage them to take up such works. 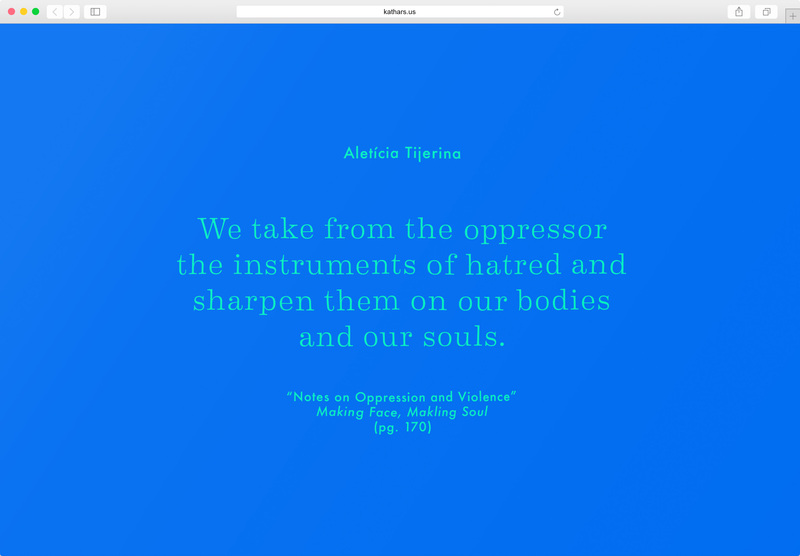 The project is a website made up of quotes by queer and minoritized individuals, all cited with the book/journal, chapter/article, and page they originate from. The quotes I chose are not all happy or uplifting in tone, but simply articulate lived experience, whether pessimistic or optimistic, hopefully allowing the user to identify with thoughts and experiences similar to their own. The quotes are featured one by one, each individualized by color. 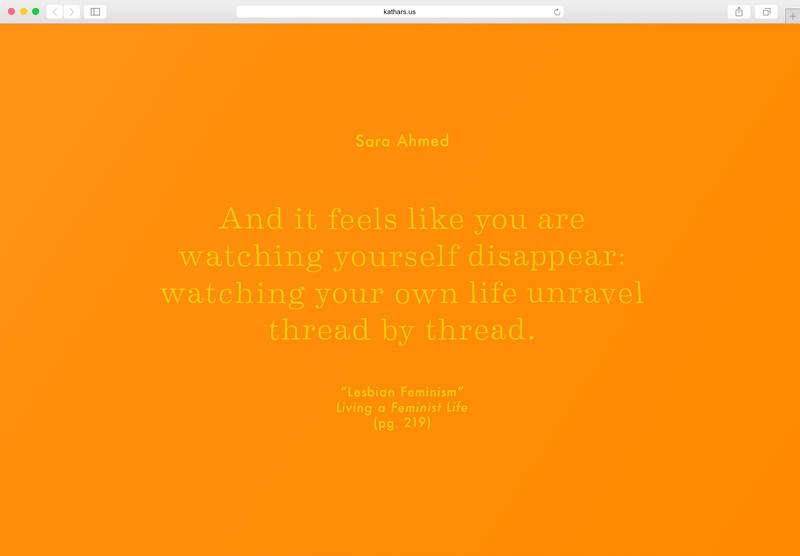 The website functions as a slideshow and there is a moment of pause in between each quote, before the next one loads, to give them each a feeling of closure.